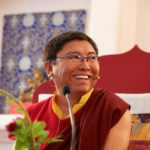 In the fall of 2006, Rinpoche asked the staff at Pundarika to find out more specific and detailed information about the Nuns’ actual living situation in Nangchen so we could know how to help in the most intelligent and efficient way. We were asked to learn as much as possible about their specific food and water needs, quality of buildings, demographics, geographic settings and medical issues. The following report summarizes the most critical findings and suggests future courses of action. For several months in 2007, the Pundarika Foundation staff and other advisors (including Dr. Mark Kane, former United Nations and N.G.O. expert on Third World medicine) worked to develop an extensive questionnaire designed to help gather both qualitative and quantitative data from the many gonpas (monasteries, mostly nunneries) within the Tsoknyi Lineage in the Nangchen region. 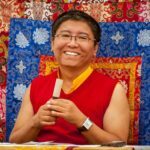 In the summer of 2007, Neil Hogan and his sister Brady, both students of Tsoknyi Rinpoche, traveled to Nangchen in Tibet and carried out this data-gathering mission. Armed with GPS devices, cameras, recording devices and the questionnaire, they traveled to all the gonpas in the Nangchen region. * The detailed data that they gathered serves as the basis for the recommendations of the Tsoknyi Nangchen Nun project team, which are summarized below. The information they sought to collect ranged from basic geographical and demographic data (location of the gonpa, number of residents, etc.) to detailed questions on food and water supplies, transport, housing and health care. They also aimed to collect information about the local communities associated with the gonpas and their relationships with the monastics. The advisors who helped developed the questionnaire included a public health specialist and a medical epidemiologist with considerable experience in rural China, both well versed in needs assessment of this kind. *Due to political sensitivity and remoteness, they did not travel in the Tibet Autonomous Region (TAR), but can estimate the number of gonpas and monastics there. The total population of monks and nuns connected to the Tsoknyi Lineage is estimated at 2,912. Of this population, 971 are monks and 1,941 are nuns. In the Nangchen region, 2,012 monastics live in 27 gonpas, and 900 monastics live in 26 gonpas in the Tibetan Autonomous Region. Thirty percent (597 monastics) of the Nangchen population (2012), who live in 11 of the 26 gonpas, are in urgent, critical or marginal-sufficiency need categories. Food: All the gonpas report that they depend primarily on the families of the nuns and monks for basic food supplies. In the past this system worked well, but due to current trends of “forced” urbanization encouraged by the government policy of “sedentarisation,” almost all gonpas report that families are less able to provide food, and some monastics have left gonpas because of lack of food. Despite the fact that some monastics have left gonpas due to lack of food and other hardships, almost all gonpas report that they are growing or expect growth. This, and the fact that many gonpas are still in the process of rebuilding means that there is a range of needs in terms of buildings, from accommodation to relieve overcrowded or substandard housing, to retreat facilities, to lhakhangs (temples) for community practice. Water: The great majority of gonpas rely on streams or springs for their water supply, usually carrying the water by hand from the source. In winter it is necessary to break ice in the streams and springs, hand carry the ice to the gonpa and then melt it for water. Many gonpas report that at least in winter, and sometimes all year, there is insufficient water for laundry, cooking, making tea, washing or even basic hand washing. Shelter and Warmth: Harsh climatic conditions quickly deteriorate and serve as the primary cause of collapse for mud and stone constructed shelters. The most urgent, critical conditions are a 1) lack of windows or doors to protect against the elements, and 2) intensive overcrowding due to a lack of structures to house nuns. Only 25% have dung burner stoves for heat and cooking (tea/tsampa). Seventy-five percent do not have any source of heat; temperatures in the winter drop to –25 °C and –30 °C with wind-chill sharply decreasing these numbers. Medical Care: All the gonpas report that they have very limited access to health care, at best. The two main barriers to health care access are 1) remoteness from providers of care, combined with limited access to transport, and 2) the financial cost of health care. Most gonpas report that even in an emergency situation that it would take a full day (or more commonly, many days) to get a person to a hospital. Two gonpas have someone in training or plans to send someone for health care training. A number of health concerns were commonly reported such as eye problems (including lack of glasses), headaches, joint pains/arthritis, coughs, gastrointestinal troubles, heart pain, fainting, kidney and gall bladder problems. The respondents overwhelmingly reported a preference for western/modern medicine for acute conditions and Tibetan medicine for more chronic care. Based on these findings, the 26 gonpas have been placed in three categories: urgent, critical and marginally sufficient. The 11 gonpas below represent a standard of living that is seriously below the already very marginal poverty line in rural Eastern Tibet. The remaining 15 gonpas are also below that line and need to be raised to a basic subsistence standard, if the Nuns are to continue to survive over the long term. Old Raya: Insufficient supply of basic food (tsampa, tea, etc. ), critical water and building needs (not enough water for cooking); no Lama (means lack of spiritual and material support); population is 76. Niching: Buildings do not have doors or windows; holes observed in structures letting in rain, snow and mud. Food supplies are inconsistent; very isolated from villages; no Lama; population is: 41. Sanche: Building repair (similar to Niching above); water is limiting factor for new Nuns and inconstant or insufficient food sources; population is 60. Mokpur: Serious building repair needed and barely sufficient water supply; population is 57. Ritro: Difficult living conditions due to number of monastics (extreme crowding); need new living structure; population is 70. Choje: (Same as Mokpur for building repair); population is 73. Sadzong: Underfunded gonpa in three areas with shortages in food, water and building; population is 20. Ku: Have basic material needs, but without a Lama (makes it very difficult to sustain long-term support); population is 30. Jashik: Cannot collect enough water to sustain basic needs for cooking; population is 111. Yulwan: Two conjoined gonpas with building repairs needed; population is 26. Chulane: Needs building repair; population is 33. Due to the severity of conditions observed at the 11 gonpas, it is recommended that emergency funds for 2008 and 2009 address their immediate needs. Once an assessment is made on the impact of these funds, they may be considered for 2009 emergency funds as well as second-tier gonpas. Note: It is assumed that the endowment will eventually apply to the 26 Nangchen Province gonpas and 26 additional gonpas in the Tibetan Autonomous Region, whose monastics primarily practice the Tsoknyi Lineage. A. Establish an Emergency Reserve: This is a reserve fund carved out of the Endowment Fund (achieved by excess earnings, new contributions and smaller disbursement amounts). The purpose of this fund is to have a backup reserve for natural disasters, unexpected one-time resource demands and non-budgeted critical projects. Although the endowment fund is designed to meet existing needs, it will not be sufficient to fund major capital projects. Water systems, transport, medical clinics, and new building construction come under this category. A catalogue, similar to Seva organization’s will be created to target these needs, once specific project selection and cost information is available. Due to the remoteness of the Nangchen region and difficulty in communications, it is important that a Nuns governance system (Nuns Council) be created to make informed decisions on resource allocation and accountability. 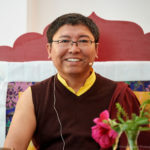 Tsoknyi Rinpoche began this process in the summer of 2005 for the initial emergency allocations in 2006. This administrative aspect of the project will require careful and sustained planning and oversight, including reporting for governmental purposes.